Were Hedge Funds Right About Piling On NIKE, Inc. (NKE)? The market has been volatile in the fourth quarter as the Federal Reserve continued its rate hikes to normalize the interest rates. Small cap stocks have been hit hard as a result, as the Russell 2000 ETF (IWM) has underperformed the larger S&P 500 ETF (SPY) by nearly 7 percentage points. SEC filings and hedge fund investor letters indicate that the smart money seems to be paring back their overall long exposure since summer months, and the funds’ movements is one of the reasons why the major indexes have retraced. In this article, we analyze what the smart money thinks of NIKE, Inc. (NYSE:NKE) and find out how it is affected by hedge funds’ moves. NIKE, Inc. (NYSE:NKE) was in 61 hedge funds’ portfolios at the end of December. NKE investors should pay attention to an increase in hedge fund sentiment in recent months. There were 46 hedge funds in our database with NKE positions at the end of the previous quarter. Our calculations also showed that NKE isn’t among the 30 most popular stocks among hedge funds. We’re going to go over the fresh hedge fund action regarding NIKE, Inc. (NYSE:NKE). What have hedge funds been doing with NIKE, Inc. (NYSE:NKE)? 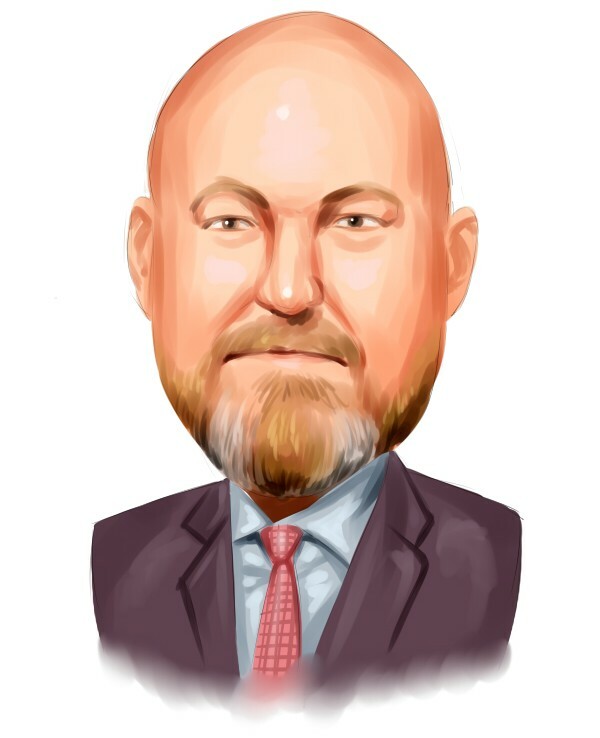 At Q4’s end, a total of 61 of the hedge funds tracked by Insider Monkey held long positions in this stock, a change of 33% from the previous quarter. 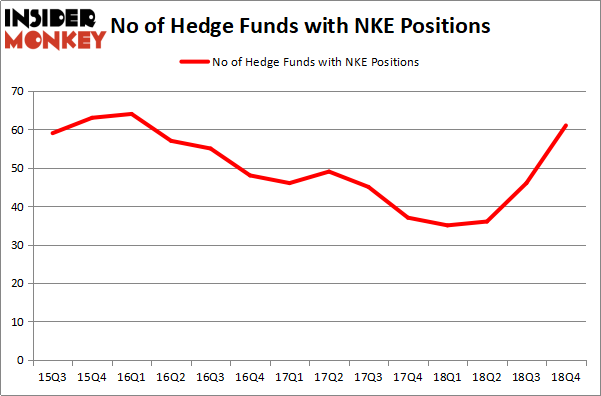 The graph below displays the number of hedge funds with bullish position in NKE over the last 14 quarters. With the smart money’s sentiment swirling, there exists an “upper tier” of key hedge fund managers who were upping their holdings considerably (or already accumulated large positions). More specifically, AQR Capital Management was the largest shareholder of NIKE, Inc. (NYSE:NKE), with a stake worth $479 million reported as of the end of September. Trailing AQR Capital Management was Orbis Investment Management, which amassed a stake valued at $191.8 million. Millennium Management, Two Sigma Advisors, and Citadel Investment Group were also very fond of the stock, giving the stock large weights in their portfolios. Now, key money managers have jumped into NIKE, Inc. (NYSE:NKE) headfirst. Melvin Capital Management, managed by Gabriel Plotkin, assembled the largest position in NIKE, Inc. (NYSE:NKE). Melvin Capital Management had $77.8 million invested in the company at the end of the quarter. The following funds were also among the new NKE investors: Edmond M. Safra’s EMS Capital, Brandon Haley’s Holocene Advisors, and Anand Parekh’s Alyeska Investment Group. Let’s check out hedge fund activity in other stocks – not necessarily in the same industry as NIKE, Inc. (NYSE:NKE) but similarly valued. We will take a look at Netflix, Inc. (NASDAQ:NFLX), PetroChina Company Limited (NYSE:PTR), 3M Company (NYSE:MMM), and Adobe Inc. (NASDAQ:ADBE). This group of stocks’ market valuations are similar to NKE’s market valuation. As you can see these stocks had an average of 54.25 hedge funds with bullish positions and the average amount invested in these stocks was $3735 million. That figure was $1941 million in NKE’s case. Adobe Inc. (NASDAQ:ADBE) is the most popular stock in this table. On the other hand PetroChina Company Limited (NYSE:PTR) is the least popular one with only 14 bullish hedge fund positions. NIKE, Inc. (NYSE:NKE) is not the most popular stock in this group but hedge fund interest is still above average and we observed a huge jump in sentiment. Our calculations showed that top 15 most popular stocks among hedge funds returned 19.7% through March 15th and outperformed the S&P 500 ETF (SPY) by 6.6 percentage points. Hedge funds were also right about betting on Nike as the stock returned 17.4% and outperformed the market as well.